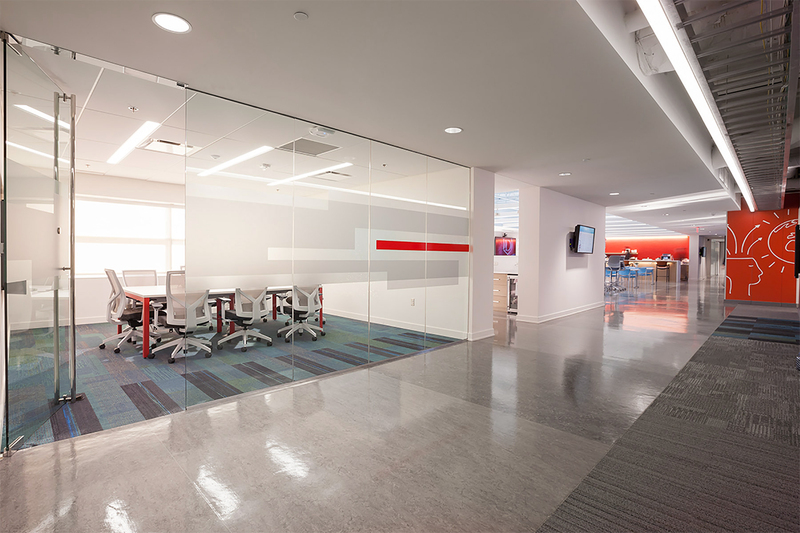 Energizing the space and making it feel like Logicalis. 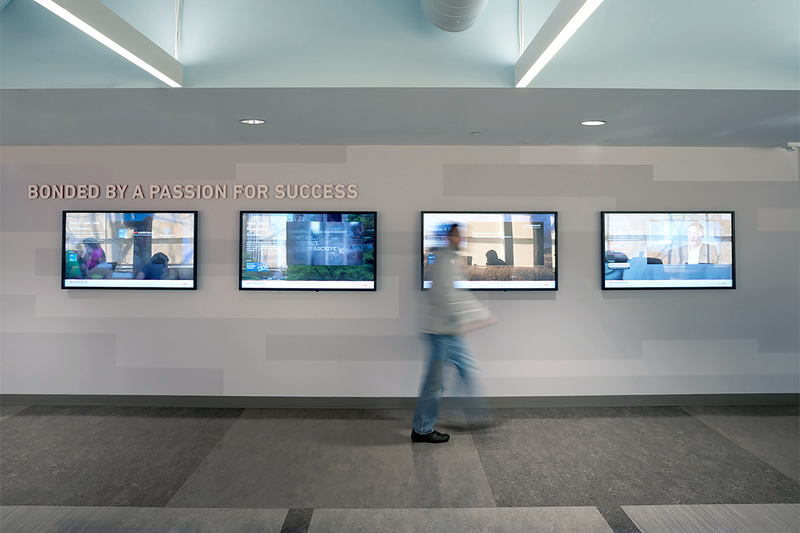 Tastefully integrating digital displays that would help tell the story. 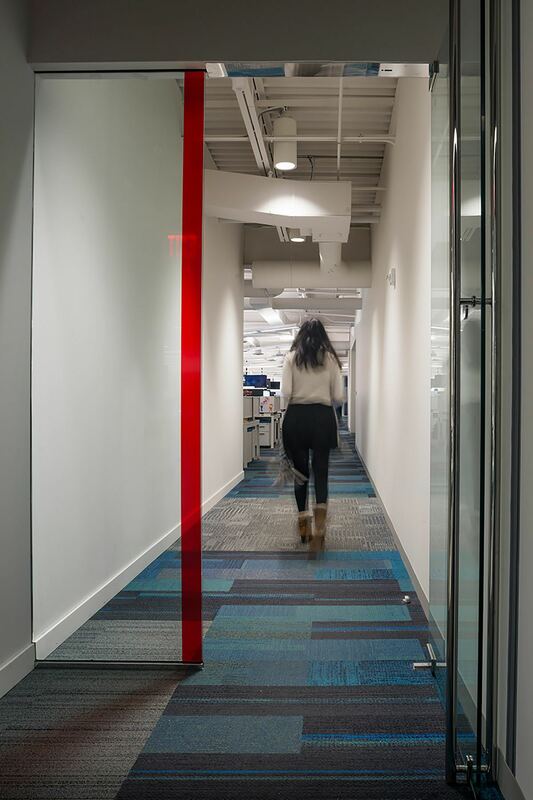 Bringing more privacy to glass walls of conference rooms and offices. Stories of successful partnerships told with dimensional letters, custom-designed wall paper with pearl finish and digital displays. 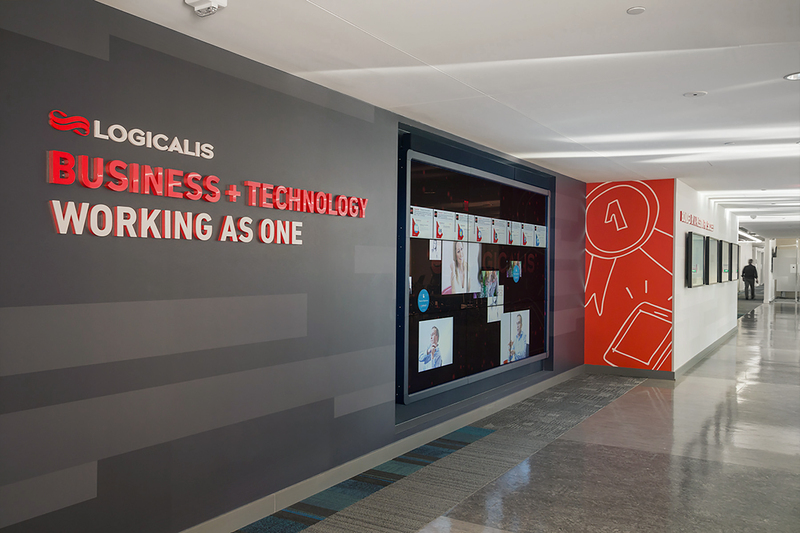 For Logicalis, a technology company, telling their story naturally involved an extensive use of interactive touch screens and digital displays. 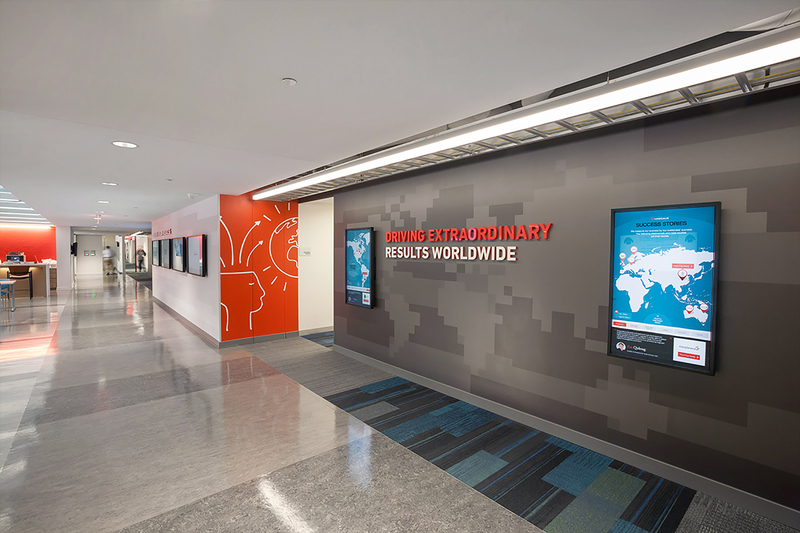 Customer success stories around the globe told with custom-designed wall paper with pique finish, laser cut dimensional letters and interactive displays. Custom-designed privacy graphic for glass walls from two layers of etched silver and transparent red window films. Attention was paid to both form and function when it came to increasing the level of privacy on the many glass walls throughout the space. According to Jon Moses, “We wanted the solution to feel like the rest of the space while offering the right balance between privacy and openness. The client loved the glass and wanted a little more privacy but not what they called a ‘shower curtain. 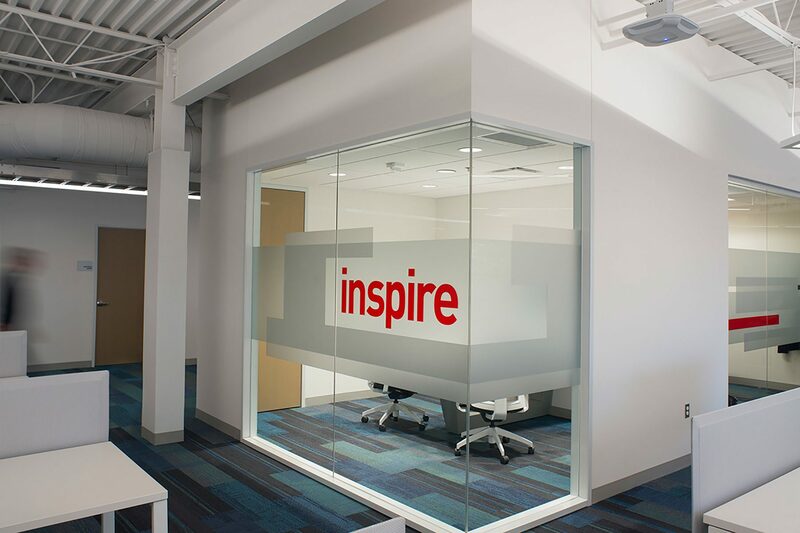 '” To solve this, Ideation’s Michelle Lannoo brought a variation of the visual melody to glass with two layers of Oracal 8510 etched silver fine-grain film that was applied to both sides of the glass. 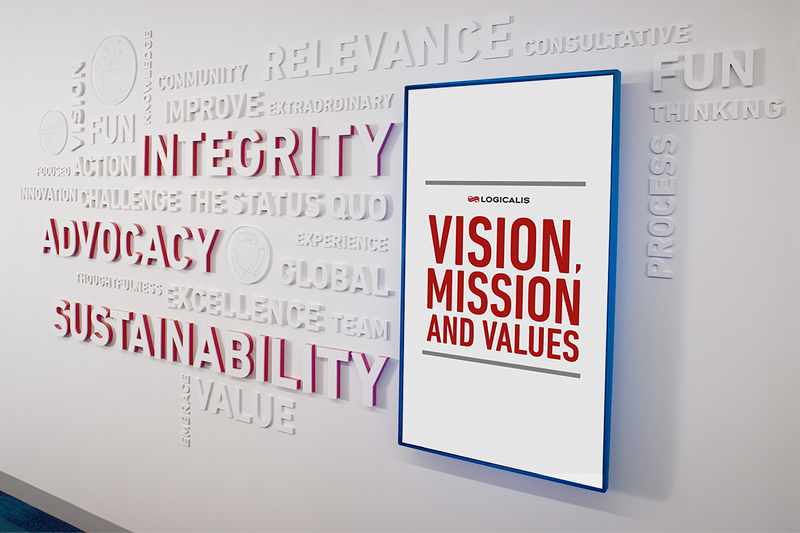 A more literal touch of the Logicalis brand was applied with a single bar of transparent red film. Client confidence in the design was achieved prior to production and installation with full-scale prototypes on 4’ clear acrylic panels that could be positioned in various locations throughout the space to test transparency and the effect of lighting. Custom-designed privacy graphic applied to huddle rooms. 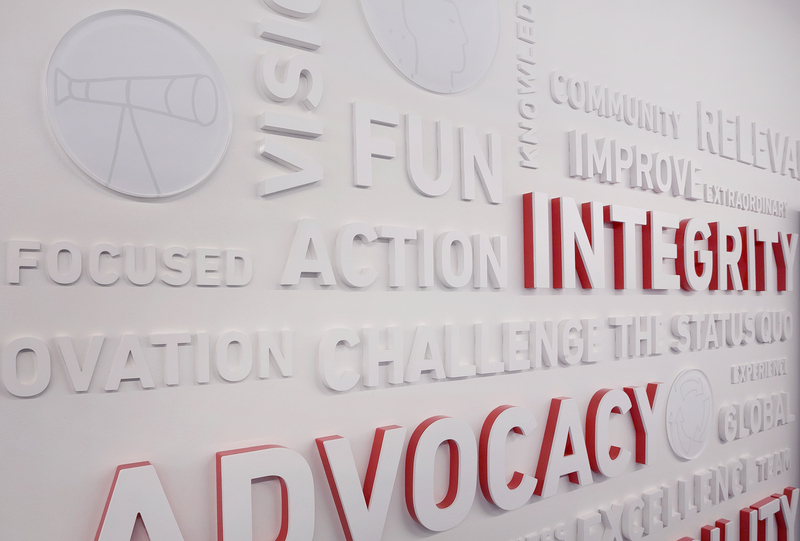 The Logicalis team came up with the words to name their huddle rooms. By bringing the names to the glass design, we increased the energy level, made the space feel like them, and told their story more clearly and visibly than with a traditional wall plaque next to the door. During the discovery phase of the project, it was learned that some of the clear glass walls had also proven to be a safety concern. This was solved with a simple stripe of transparent red film. 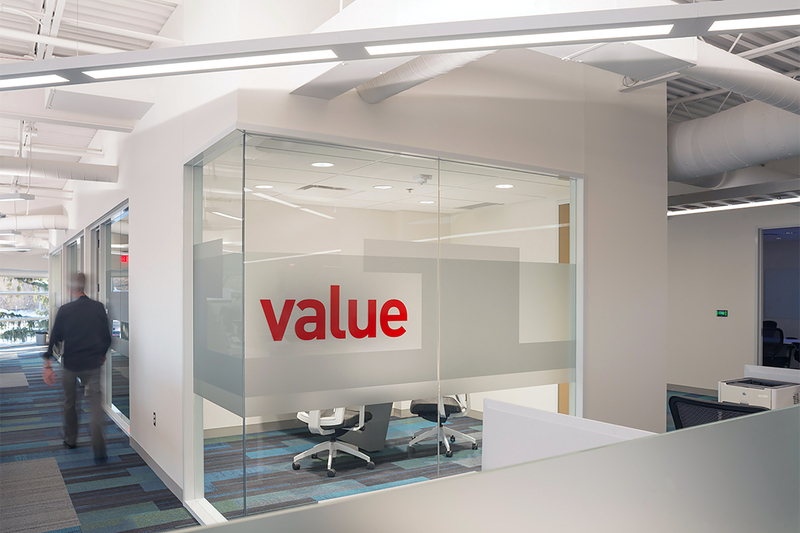 The values of the company were told on two separate walls. 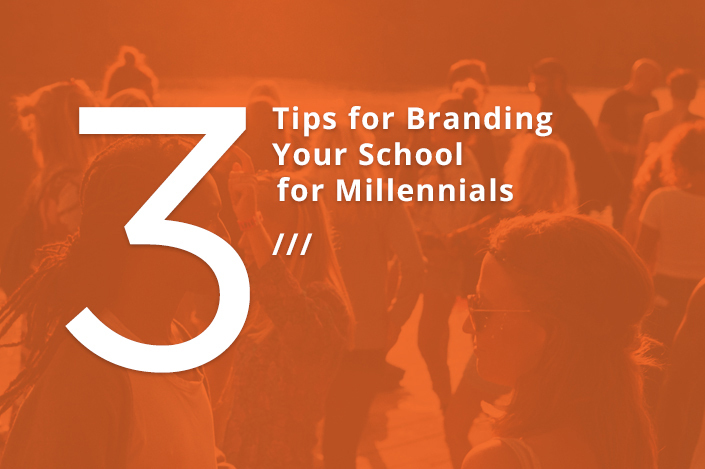 While digital display told stories about the values in action, the three core values and other brand words were intended to feel more enduring. Company values expressed in 376 characters in 4 heights and 3 depths from precision laser-cut acrylic, finished to brand colors.